BANGKOK – August 29, 2017 – Six Senses Hotels Resorts Spas is delighted to announce plans to open Six Senses Fort Barwara featuring 48 suites in Rajasthan, India. Situated 68 miles (110 kilometers) southeast of Jaipur, the property is located in the village of Chauth ka Barwara on the site of a 700-year-old fort which was owned by the Rajasthani Royal Family and sits directly opposite the temple, Chauth ka Barwara Mandir. The Barwara Fort was constructed in the 14th century by the Chauhans (Indian Rajput caste) and was conquered by the Rajawat Dynasty from the Hadas in 1734. During World War II, Raja Man Singh from the noble family of Barwara along with Jaipur State Armed Forces fought alongside the British. In appreciation of his services he was bestowed with the title of Rao Bahadur. His grandson, Prithviraj Singh, is now restoring the fort to its previous glory in tandem with Espire Group. The project team will seek the five-star green rating for Integrated Habitat Assessment (GRIHA) certification, the highest classification of national sustainable design ratings in India. Design efforts are being led by a team of conservation experts to preserve and protect the original fort structure. The 5.5 acre (2.2 hectare) site is encircled by an imposing 5-foot (1.5 meter) thick rock wall that rises up to 20 feet (6 meters) in some sections. Inside the historic fort, three buildings which traditionally accommodated the common, men’s and women’s palaces and two temples are being preserved and restored. Outside the fort, the property faces the local village to the west and protected land that will be reforested to the east. Panika, under the leadership of Nimish Patel and Parul Zaveri, known and respected for their conservation work is overseeing architectural design. Slated to open in late 2019, Six Senses Fort Barwara will feature two restaurants, bar and lounge, 30,000 square foot (2,800 square meter) spa and fitness center, two swimming pools, banquet space, retail boutique and kids club. The key focus of the landscape concept is to reinterpret the gracious and regal ambiance experienced at Rajasthan’s royal forts and palaces. Rooted in the rich history of the fort, the design will include traditional gardens and water features. 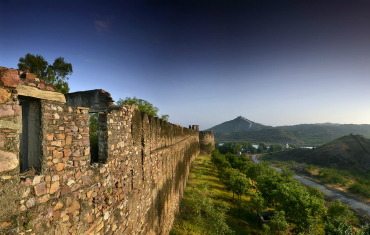 Shekhavati art will be used to depict the rich history of the fort in the landscape. An impressive Six Senses Spa, located in the original women’s palace, will feature an extensive ayurveda program, meditation and Six Senses Integrated Wellness programs including Six Senses Integrated Wellness and Sleep with Six Senses. Thirty minutes from the Ranthambore National Park and famous for its tiger population, Six Senses will offer daily safari drives into the 540 square mile (1,400 square kilometer) park. The sanctuary is home to a variety of wildlife including leopard, nilgai, wild boar, sambar, sloth bear, southern plains gray langur, rhesus macaque and chital plus a wide varierty of trees, plants, birds and reptiles. 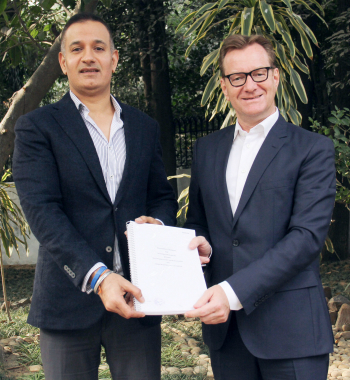 Chief Executive Officer Prithviraj Singh of Espire Hospitality (left) and President Bernhard Bohnenberger of Six Senses Hotels Resorts Spas sign Six Senses Fort Barwara management agreement. 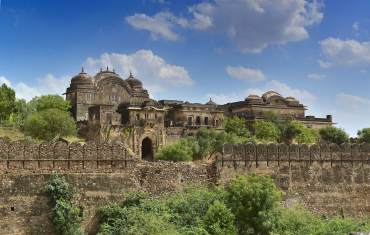 Six Senses announces plans to open Six Senses Fort Barwara in Rajasthan, India. Six Senses Hotels Resorts Spas operates 11 resorts and 31 spas in 20 countries under the brand names Six Senses, Evason and Six Senses Spas.